I love this awesome half cream and half leopard print chiffon top. Simple button up with a collar and an open back, goes perfectly with my HALF bleached and studded cut offs for an edgy summer look. I continued to play with the theme by wearing my HALF tint sunglasses! As for the giveaway, scroll down all the way for details! Half & half leopard print chiffon top by Love Audrey 3+1 from my work Sway. Bleached and studded vintage Levi's cut offs from Etsy. 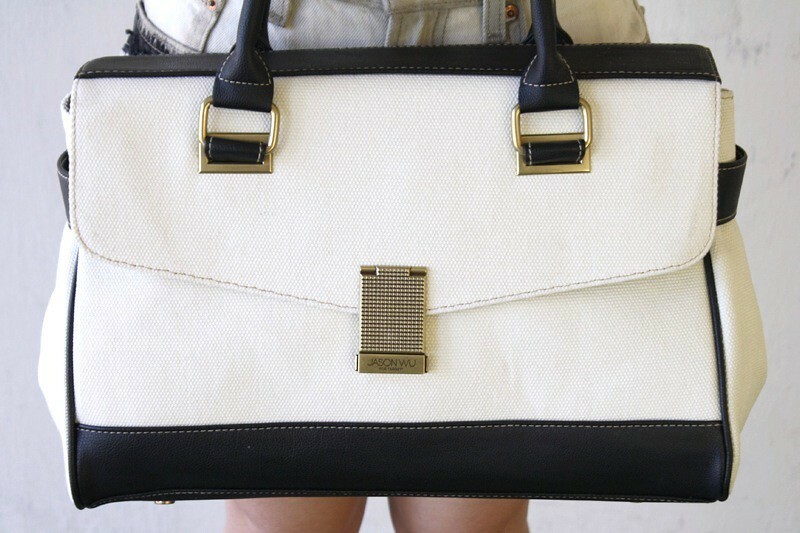 Leather and canvas handbag by Jason Wu x Target. Half tint sunglasses from it's not her, it's me. 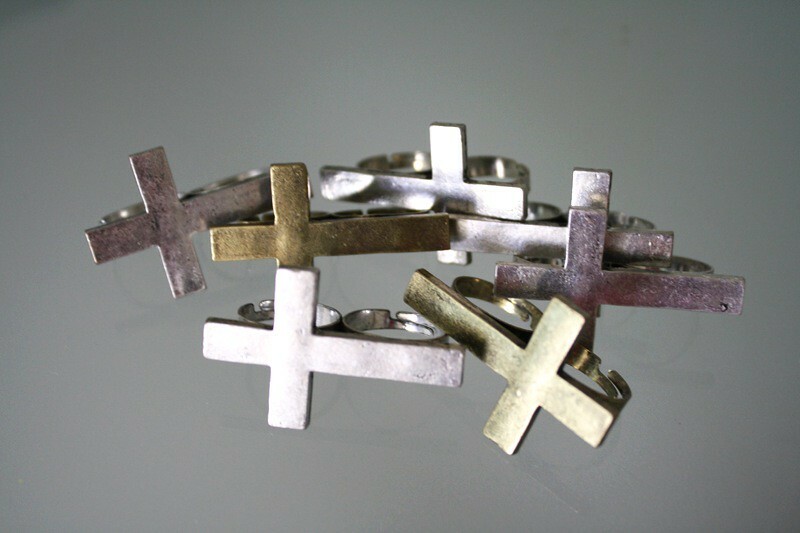 I am giving away these awesome cross double finger rings from my shop it's not her, it's me. 2. Leave a comment here with your email and how you would rock these rings. 3. For an extra entry, fan me on lookbook. That's it! Winner will receive two rings (one silver and one gold) and will be chosen at random and announced next Wednesday! Good luck! Hey ! Thank you for this giveaway, I'm following on GFC and I'll style those ring with a vintage hig wasted Levi's short and a cool and laid back sweater with maybe some sandals or Ash boots. aaaaaaaaa, i love this outfit! Hey! Great outfit, so in love with your blouse! I would rock these rings with brown leather shorts, a white button up tucked in. For shoes I would do some Jeffery Campbell black Lita's! Ahh love those rings, would be a perfect fit for building my collection. I soooo love that leopard print top!! It's gorgeous! And those shorts are really awesome too! but actually, I kind of think they match with everything, almost that is. I would wear them with something grunge. Like, with my leather pants (brown), with an adorable rose blouse and some studded shoes :)idk yet, but thanks for giving people the opportunity to actually win something :) very original idea! I would wear the rings with a lot but probably with cute girly skirts to toughen them up a bit~! love the whole outfit. Leopard print is my weakness. Love the rings, I have been obsessed with double rings for awhile now. I have one that has a bird on it but the crosses seem a little more badass. I'd wear with my vintage leather jacket, asymmetric bottle green skirt from Romwe, UO 'peace' belt (like the Moschino waist belts with gold lettering, but it says 'peace; instead)and I have the same shoes as you're wearing here, and they rock! So them too! 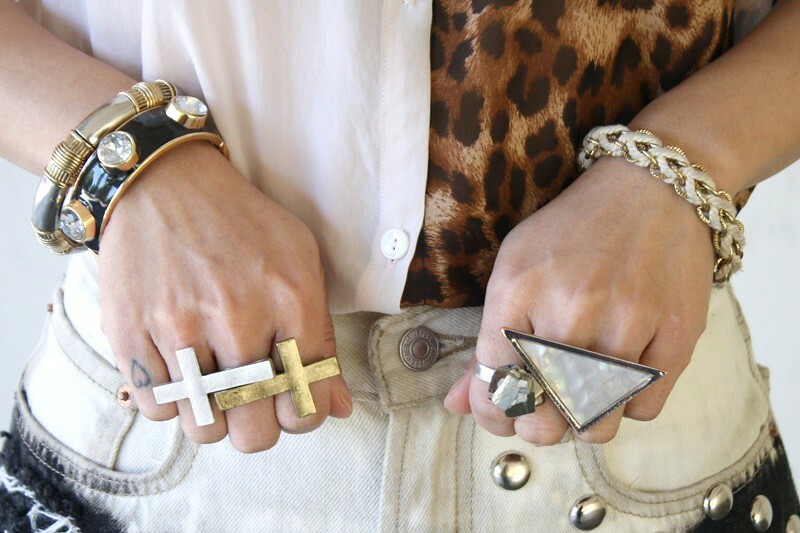 I'd stack these rings with some above the knucke rings from Fashionology.nl that I love! AMAZING blog, following!!!! Great giveaway! I'd wear them with a leather black jacket, a regular neon t-shirt, a pair of white skinny jeans and lita from jeffrey campbell into the feet! i´d wear it with shorts and shirts. Oh man, I love these rings..What an awesome giveaway my lovely ! following you on bloglovin, gfc and lookbook ! i am following you on blog loving, gfc and i have fanned you on lookbook! i love your fashion sense and i especially love those rings! i would wear these rings with my all saints studded leather jacket, my black crochet shorts 10 denier tights and studded killer boots!